354 pages | 515 B/W Illus. Engineering Science is a comprehensive textbook suitable for all vocational and pre-degree courses. Taking a subject-led approach, the essential scientific principles engineering students need for their studies are topic-by-topic based in presntation. 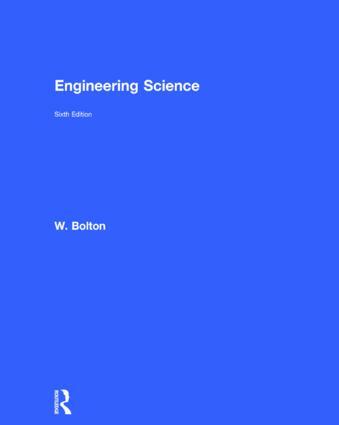 Unlike most of the textbooks available for this subject, Bill Bolton goes beyond the core science to include the mechanical, electrical and electronic principles needed in the majority of courses. A concise and accessible text is supported by numerous worked examples and problems, with a complete answer section at the back of the book. Now in its sixth edition, the text has been fully updated in line with the current BTEC National syllabus and will also prove an essential reference for students embarking on Higher National engineering qualifications and Foundation Degrees. W. Bolton was formerly Head of Research and Development and Monitoring at BTEC. He has also been a UNESCO consultant and is author of many successful engineering textbooks.